With the U.S. release of Apple’s long-anticipated iPad over the weekend, gadget gurus and media analysts are all aflutter with their take on the device. Here’s a roundup of some of that coverage. * Media Bistro’s FishbowlNY has a survey of available magazine apps, including Men’s Health, The Wall Street Journal, The New York Times, Popular Science, Bloomberg, USA Today, and travel publisher Lonely Planet‘s app that is a list of its 1,000 most recommended experiences. The Mac Observer has another survey of available apps for newspapers, books, magazines, and TV. 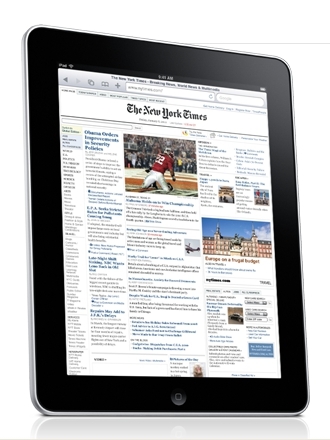 * John Aloysius Farrell, a contributing editor at U.S. News & World Report, writes that the iPad “is everything it was cracked up to be, except the savior of journalism.” Farrell is pretty disappointed with the quality and quantity of news apps so far. He does provide an in-depth analysis of Time‘s app which he finds takes full advantage of the iPad’s features, however. His review of The New York Times app is not quite so favorable. * Damon Kiesow at PoynterOnline provides us with the oh-so-surprising news that free apps are getting downloaded more frequently than paid apps. Kiesow also reports that after the iPad’s first day, the majority of Top 10 downloads were content-related, compared to the iPhone’s Top 10, which was largely comprised of games or entertainment apps. Like Farrell, Kieso also gives the Time magazine app a thumbs-up. * Joshua Benton of the Nieman Journalism Lab compiles a list of three design elements from iPad apps that he predicts will influence how we read online news. All three elements deal with story navigation including “diving right in” to content rather than presenting the reader with a list of headlines from which to choose. * Kevin Hall at DVICE compiles a list of five surprisingly good things about the iPad, including a longer battery life than promised by Apple and a wide viewing angle for video. He then compiles a list of the Top 20 complaints from fellow bloggers about the device, including the opinion that simply upscaling old iPhone/iPod Touch apps for the iPad doesn’t work. Time getting $200,000 each from Unilever, Toyota Motor, Fidelity Investments, and at least three others for single ads in the first eight issues. Wired is offering different levels of ad functionality based on a number of ad pages bought. For example, eight pages of ads in a single issue will give the advertiser video and extra features. Men’s Health will offer 10 free pages of its April and May issues thanks to a marketing deal with Procter & Gamble. The Wall Street Journal has four-month, $400,000 ad packages with six advertisers, including Coca-Cola and FedEx. The duo writes in their March 24 article, “In part because of the limited number of marquee ad spots, many magazines have sold out of ads for their maiden iPad issues — nevermind that most publishers and marketers haven’t even finished designing the apps and ads and that it’s unknown how many people will buy iPads.” They also report that some magazines are requiring print ad purchases in order for advertisers to purchase ad space on the iPad versions. Image by Apple, used under Fair Use: Reporting.